It is that time of year, when the national dress code for guys is a skin-tight shorts, borrowed from the rickshaw-puller's son who lives nearby. On top, you display your manly shaven/unshaven chest out to the world. If unshaven, the chest-hair should be of contrasting bright colours - such as magenta, yellow or sea green - if shaven, then this chain of thought is rendered pointless. The vest that used to be, better known as baniyan (no Noelle, not banyan. That's a tree! ), is so deformed that you use it as a belt instead. Your flip-flops are torn but you're unwilling to let them go.. But then all that don't matter, because you're coloured entirely in black, filthy green and silver and it won't be making any difference to an unassuming onlooker, even if you go naked right now. The festival of colours, ladies and gentlemen, is an official license for people to launch a colourful assault on each other. And it always brings back sweet, and some bitter-sweet memories with it. Take my earliest memories of Holi for example. I remember parts of it in flashes and gasps of unhealthy memories: Grime, grease, mud, faeces, filth, revolting shades of green, black, brown, silver, grey. Yes you got it right, it was Holi in the state of UP! There isn't a single account of the festival, where I wasn't crying. The day before Holi, however, was pleasant and worth remembering time and again - Helping mum prepare 'Gujiyas', cleaning the entire household, cooking delicacies for the next day, watching Holika dahan and of course, buying the same colours I'm destined to be assaulted with, the very next day. I missed Holika dahan the most, as we shifted to Kolkata. One of the prime reasons Holi lost it's charm to me eventually. Holika dahan was every kid's dream - a reason to stay up late on a non-festival date! It was campfire, where the uncles from the neighbourhood would gather and bawl local songs having coarse lyrics (that absolutely made no sense to us, but bestowed pure entertainment all the same)! 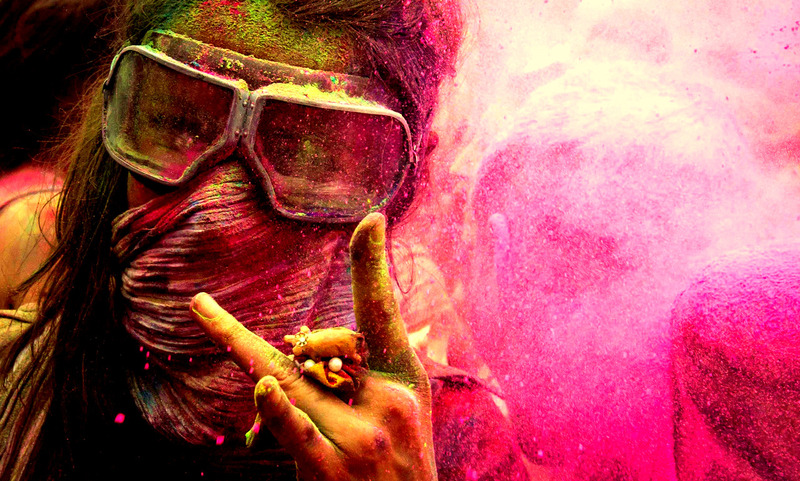 Holi made a comeback as I came to my teens, and this time it was in a better avatar. I got involved among the baccha party in the residential complex I lived in, in what was a daunting task of strategizing and planning for an exclusive celebration of the festival. Divided would be the teams, plotting against each other. Oh, there would always be the teams! And their aerial units, to hurl water-balloons from the terrace on the 12th floor at unassuming kids, lurking in the courtyard among elders. Like that'll save them! The sources of tap-water would either become a no-man's-land (if a patronizing adult was present) or bunkers (if left entirely at our discretion)! There would also be the challenge of who would be the first to put colours on The Girl. And it would be an added advantage if The Girl would voluntarily want to be painted by you first. Been there, done that! HA! Nailed it, didn't I? Then there was a Holi-related episode in school involving Potassium permanganate, that I'd rather not recall! This year's Holi is over, and I must say I had fun! I took the convincing plunge of celebrating it with strangers, after a long time from celebrating it at all. Without friends or family, whom I no longer associate with this festival, playing Holi with strangers turned out to be fun! There was no prejudice, no last time ka hisaab chukta, no reservations involved. Only the pure feeling of belonging to a common community. I may not believe in the divinity and religion, but I fit right in on a social front. So, have a very happy festivity my dear readers! I'm aware that we have some new readers, who joined my blog recently. I love you all so very much. Keep reading my posts, commenting on em and spreading the love. Until next time, Ciao! Wishing a very happy holi to you! Balloon throwing business.. God, it was so much fun! I did have a good time, thanks.. Happy Holi! I'm glad you liked reading this one.. The girl fact maybe, was unknown to you, but you definitely knew the girl! Sundaram days were so much fun, man.. Thank you, I try to write as lucid as possible for everyone to understand. :) I haven't played proper Holi among friends in a long time, dunno how but it has lost it's charm on me.